Back in 1984, Marvel successfully spun off the main Avengers title into a second group who would keep watch on the western coast of the U.S. In the Marvel Universe, that seemed like an overdue move, as nearly all of the main superheroes are based in New York City. First a limited and then a full series West Coast Avengers (later retitled Avengers West Coast, I assume so that the Avengers books could be next to each other alphabetically), this team succeeded because Marvel combined some B-list heroes like Tigra and Wonder Man with Avengers staples like Iron Man, Hawkeye, and the Vision. 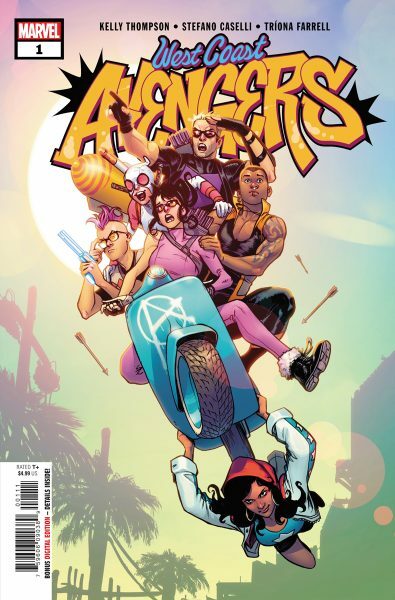 Marvel recently released a new West Coast Avengers series, written by Kelly Thompson and illustrated by Stefano Caselli, and the first issue fails to recapture the feeling of the original California-based Avengers series. 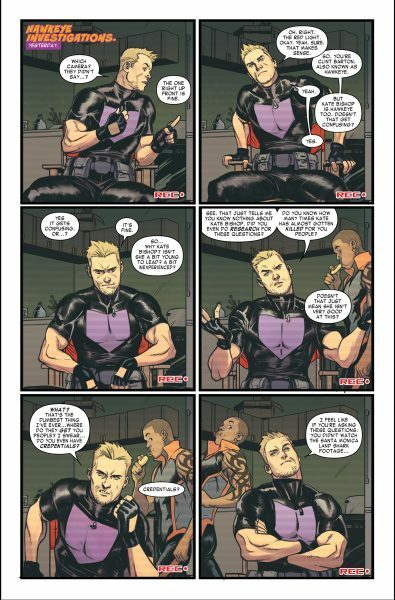 Thompson is the writer of the Kate Bishop Hawkeye series and West Coast Avengers #1feels like a spin-off of that much more so than of any other Avengers-related title. Bishop is running her own private detective agency but realizes that her and her bow can only do so much to protect Southern California. She starts to form a team but finds it difficult to attract reputable heroes to the area, mostly interacting with rejects and delusional wannabes. Eventually, with help from the other Hawkeye (Clint Barton), she forms a team comprised of the two Hawkeyes, America Chavez, Gwenpool, mutant Kid Omega and new character Fuse. I give the series credit for forming the team right away. It irks me when a new team books takes an entire first arc (or more) slowly working the machinations necessary to bring a disparate group of heroes together. It can be annoying because we know they are going to get together, so just do it and move on. I credit Thompson for just throwing the characters together right away so that we can see how they work together. On the flip side, I’m not sure this is the most compelling group of characters. There are some good ones – both Hawkeyes are likeable and Chavez is a character with a lot of potential. However, the others are written in West Coast Avengers #1 as stereotypes: Gwenpool is the sarcastic psycho, Omega is the narcissist who underestimates his opponents, and Fuse is just a nervous new hero/supportive boyfriend. I realize that this is only one issue but I feel that Thompson either needed to have a mix of more established heroes or do a better job with characterizing the lesser known heroes. As it stands, I do not feel interested in half of the current lineup. However, West Coast Avengers #1 will likely succeed or fail with a reader depending on his/her feelings about the tone of the comic. It is the most noticeable element of the first issue and falls outside of the normal Marvel dynamic. The tone of West Coast Avengers #1 is somewhere between silly, jokey and goofy. It is not 100% a comedy book but if this was a movie it could be classified as an action comedy (with emphasis on the comedy). There is nothing inherently wrong with funny action, but I didn’t find the comedy particularly funny. There are a lot of quips and some slapstick stuff, but most of it did not land for me. I think the best way to get across the type of humor in this issue is that the comic ends with a buff surfer dude arriving and declaring that he is B.R.O.D.O.K., which stands for Bio-Robotic Organism Designed Overwhelmingly for Kissing. If you think this is amusing, then you might dig West Coast Avengers. For me, I may left out an audible groan when I got to this page. The best element of West Coast Avengers #1 is the art by Caselli. He has a fluid style that is expressive while also feeling somewhat connected to real physics and physiology. Caselli seems to combine the best elements of manga-style illustrated – dynamic action and very expressive faces – with a more traditional Marvel style illustration. There are times where I think Caselli overdoes the “funny reaction” type of facial renderings, but his style feels well suited to this title. He also captures the look of Santa Monica, where most of the issue takes place. The problem with funny action is that it can make the stakes of the narrative feel inconsequential. In this issue, the team is battling a group of large sharks and then the former WCA Tigra, grown into a giant. I don’t feel that there is real danger in the issue, despite the sharks and giant tiger woman. 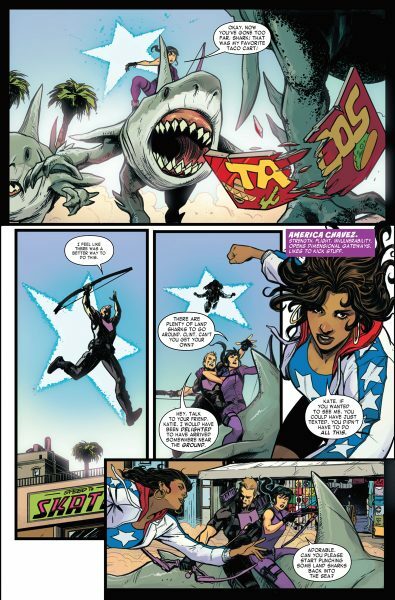 That doesn’t mean that West Coast Avengers can’t eventually hit the mark for funny action, but it needs to move there pretty quickly in order to make readers want to keep going.